Yes, for sure. I always thought that would disappear after a while. But I even think that this relationship is getting stronger. Only now I do feel how much I have taken from this mountain for myself and my life. A very deep serenity. A lot of confidence. And belief in a power from within. And in a divine power in the mountains too. Do you still follow what happens on Everest, e.g. 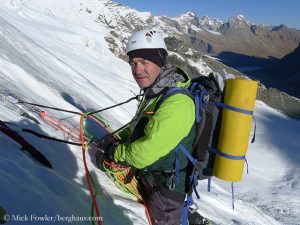 now the winter expedition of Alex Txikon? Yes, with great fascination. After Christmas follows this rather quiet time in January. I always feel like everyone is going to Everest, but not me. (laughs) Friends or acquaintances set off, as well as other mountaineers who are posting on Twitter, Instagram or Facebook. There is so much energy and great anticipation. And this always reminds me of my anticipation back then. 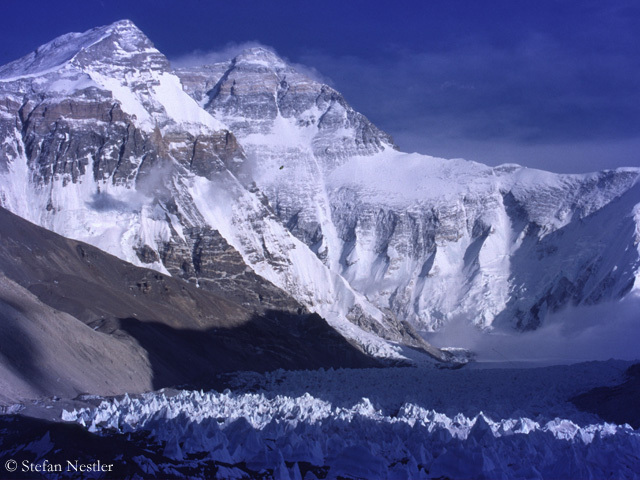 What has changed in your view on Everest since 1999? It was still relatively quiet on the north side. We were a total of about 150 people on the mountain, including kitchen crews and base camp managers. That did not feel so crowded. If I now see the pictures, there is much more going on there. But that’s the way it is in our world. There will be more and more going on everywhere, of course on Everest too. Do you feel that the mountain loses its dignity? No, it can not. 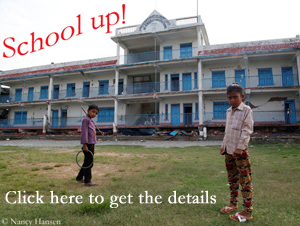 I also find it very difficult to say how the Nepalese government is currently doing: Some are allowed, others not. I think it’s very difficult and always unfair to exclude people from ascending there. The mountain has a tremendous aura and attraction. There are just a lot of people who really want to climb it. I can understand that very well. Do you sometimes still dream about your ascent? No. But for a while I had something of a horror dream about Everest – perhaps caused by the pictures of the accidents or even the giant queue of people, hundreds of climbers on a single route. That’s terrifying. At that time I dreamed that the Chinese would have built a lift from the middle of the mountain to just below the summit. Upstairs there was a little house where you could take a break. From there they all went off, with trainers! In the dream I was quite excited: They can not climb up wearing trainers, that’s too dangerous. I have to hold them back! 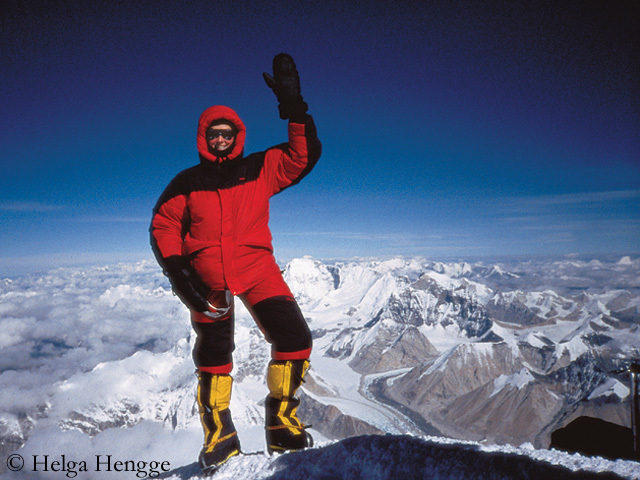 You were the first German woman who reached the summit of Everest and in addition came down alive. Do you have the feeling that the public has realized this? I think so. In my lectures, I am often asked about it. I was living in New York at that time and just traveled to Everest. I had no sponsors. Back then I was not aware that I would be the first German woman to succeed. I found it out only afterwards. If I had known it before, I would probably have exerted myself more than I did and lamented less. That would certainly have benefited my team. Did they pull you up to the top? No, it was not that bad. But without the Sherpas, the tigers of the Himalayas, I certainly would not have climbed up there. 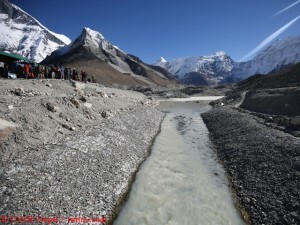 For some, Everest is the highlight, after which they scale down their mountain activities. For you, it was obviously more of an initial spark to set off to the mountains of the world. At first. I tried to scale four eight-thousanders and succeeded on one of them, Shishapangma [She reached the 8008-meter-high Central Peak in 2001]. Then I met my husband, started a family. With two small children, you can not just leave. 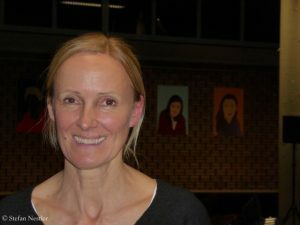 Later I focused on the Seven Summits, which I completed by 2011. One summit every year. Last fall, you were back in the Himalayas, in the Indian part, on the six-thousander Shivling, a prestigious mountain. What did attract you? It is the holy mountain of India and has fascinated me for a long time. It is a technically very difficult mountain, certainly at the limit of my ability. But the climb was not so important to me. I really wanted to make this pilgrimage and spend time there. It is truly one of the most impressive mountains I have ever been to. A great happiness shines out of it. Whenever I think back to the expedition, I have to smile because it was so beautiful. Although you had to turn around 400 meters below the summit due to the risk of ice debris? We turned around with a heavy heart because we had worked so hard on this mountain. Three days later we were trekking back. Near the glacier snout of Gomukh, the holy spring of the Ganges, we met a sadhu [a “holy man” in Hinduism] who was hiking up the pilgrim’s path. He asked me, “Where have you been?”- I replied, “On Shivling.” We were disheveled, with sun-burnt faces, we really looked wild. Then he said: “Lucky you!” Only then I realized how right he was. May be it was just one day missing to succeed. But we were so lucky to take this special trip at all. Are there any other big mountain dreams you still have? One after the other. 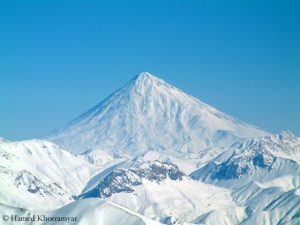 I would like to travel again to Mount Damavand [5,611 m, the highest mountain in Iran] where we were not able to reach the summit last year because of a wild storm. And then there is another holy mountain in Iran, Mount Sabalan [4,811 m, the third highest mountain of the country]. I would like to visit it too. It sounds like you’re not just looking for high altitude, you’ve changed your priorities. A lot. After Everest I fell into a deep hole. Three years of preparation and I never asked myself, what will I do after having climbed Everest? It was hard. After that I strenously tried to climb other eight-thousanders, that was not my scene. Then, thank God, I found the Seven Summits. But when they were over, it was again very difficult for me. Finally, it had been a project over 14 years. Suddenly you stand on the last mountain and should actually be the luckiest person on earth. But you have no more reason to prepare for something. However, now I have the holy mountains and they are endless. They exist on all continents, in all religions and cultures. That’s actually the much nicer goal. 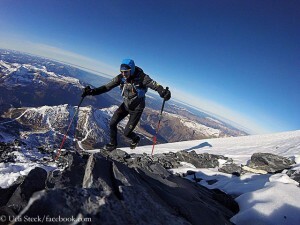 The experience on Mount Everest in spring 2013 has changed Ueli Steck. 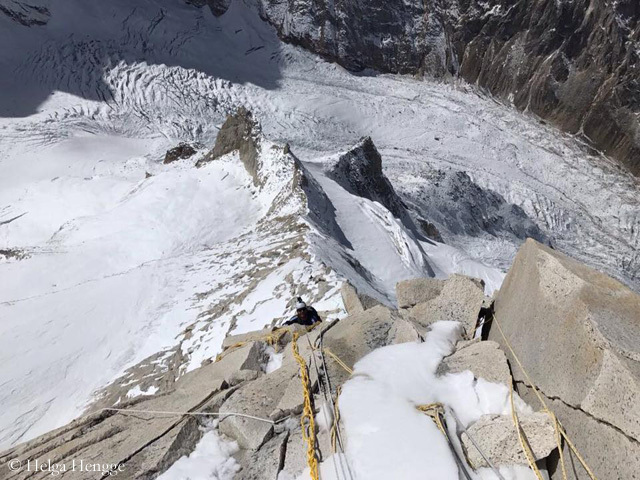 “The moment when I realized that the Sherpas wanted to kill me, a world came crashing in,” the 40-year-old Swiss top climber wrote in his new book “The Next Step”.